Probably the two most obvious features of the Fens leaving aside their flatness are the skies and water. Although everywhere has sky, like the seas and oceans the Fens have an abundance of sky. When as we so often are, blessed with a spectacular sunset, it is as if some one has painted an ever-changing vast canvass for us to view. These sunsets were photographed between August and October this year. The following shots were from North Bank all taken the same evening the hot air balloon was descending as it came into land intending to land in what light remained. The photos were taken over a distance of approximately one and a half miles and a time peiod of about fifteen minutes. We have started to make a few memorial and celebration products. We have just made this decorative iron memorial obelisk to go over the buried cremation ashes of a deceased golfer. It is a variation of our Memorial obelisk, itself a variation on our Traditional obelisk it has been galvanised and then powdercoated. I have lived and worked near, in and around the fens all my life. The battle to reclaim the land from the waters has had a fascination for me ever since I have known about it. In reality to describe it as a battle is to diminish what has really been a war, at times the waters have taken back with ease, that which was won with much hard physical work. The most honest evaluation is probably that which has been taken is held; mammoth and innovative engineering maintain the status quo. I have in my lounge a reproduction of a 1645 map of Huntingdonshire, with the Isle of Ely and part of Cambridgeshire. A good portion of Huntingdonshire and the Isle of Ely are shown as under water with a few towns and villages as islands within the waters, I have another map of about a similar age titled Inumdatum which gives an indication of the extent of the waters. 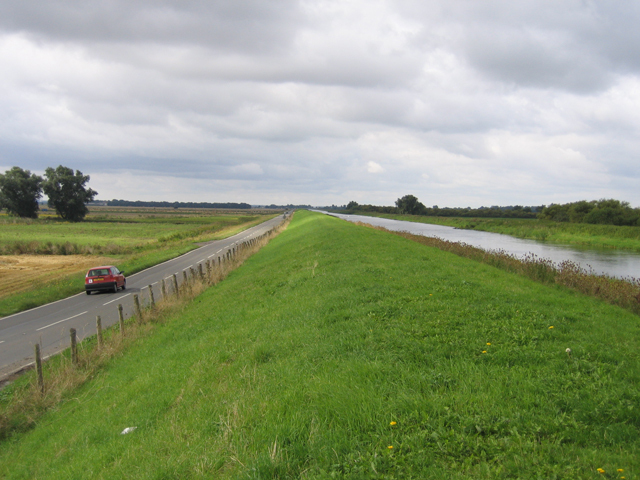 The drainage of the fens has been achieved over many centuries the long straight waterways (drains), dug mainly by hand. A truly spectacular sight to me is to drive along a road with the river above me on one side above the height of the van and ten twenty feet or more below me on the other side are the fields with crops growing in them. The photograph shows in an instant the monumental achievement in reclamation of land from the water the land below the road has to be drained by emptying it into a river or drain above it rather than below it. When you realise a cubic metre of water weighs a tonne the colossal scale of the feat becomes more apparent. Every drop of water in that and many drains and rivers in the fens that has been run off from the fields, has to be physically lifted considerable heights to keep the ground dry and usable. To start with wind was used to power pumps and giant scoop wheels to lift the water then steam, diesel and now electric pumps do the work. With the appearance of wind turbines in the fens, ultimately they are now to a degree being drained again by wind power. I have been thinking about the change in communications, (does it hurt? well a bit), the papers well certainly the Sundays are less about news and as much about froth, the colour supplements out weigh the paper itself . Weekly free papers we receive have moved considerably away from news content and are substantialy advertising vehicles. Are we consuming our news nearly entirely away from the print media, both locally and nationally, has the print media given up on objective balanced reporting? Can this also be said for specialist magazines although my local newsagents shelves seem as full of all kinds of different specialist publications as ever, sales seem to be declining. We have discussed here, on the forum, advertising response from gardening magazines and the concensus seems to be pretty much in the don’t bother camp. How do we think, we will in the future, consume our news and follow our interests, will it be on the internet, through networking sites both social and interest based (such as the GardenNetwork), television, will there be a revival in the printed media or will there be something new perhaps blending elements of all three coherently together. I have discussed this with my daughters who feel that a magazine is a simpler media to navigate than pages on the intenet, I find this also but assumed it may have been an age thing not so apparently, my daughters are in their twenties. The greatest advantage I enjoy on the internet is interactivity, I can respond to articles, seek feedback and often get sound useful advice very quickly, this is something that television doesn’t yet in my experience allow or for that matter does the print media. Do those of you who buy gardening magaazines buy less of them, feel that they are less useful than they once were or have they improved and suit your interests better.